The Externship Program is a research exchange program that allows New Mexico graduate students (with an existing assistantship) to spend a semester or summer doing research at a partnering New Mexico university or research facility. 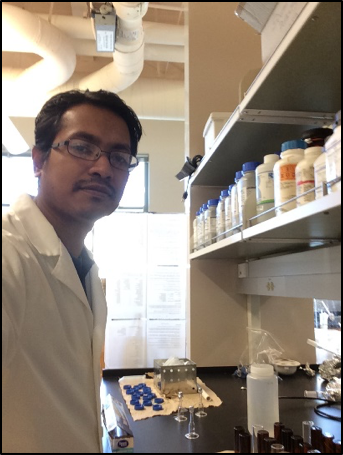 This report is from University of New Mexico student Asifur Rahman about his time as an extern at the USGS New Mexico Water Science Center. I participated in the NM EPSCoR externship program for the fall 2016 semester. As an international student at the University of New Mexico, it was truly a wonderful experience for me as I got the opportunity to conduct research at UNM lab facilities and at the USGS New Mexico Water Science Centre, my host institution. My research work involves investigating the impact of burning intensity on wood ash mineral composition and reactivity with water. For fall 2016, I collaborated with Dr. Johanna Blake, my host institution advisor, on sample collection for the project. With Dr. Blake’s mentorship, I conducted field measurements of pH and Dissolved Oxygen in water and collected soil and tree samples from Valles Caldera National Preserve area at Jemez Mountains, New Mexico. I improved my analytical skills immensely by working with a talented group of researchers in the E-H2O research group at UNM. During Fall 2016, I worked in the Analytical Chemistry lab in the Earth and Planetary Sciences department at UNM and collaborated with Dr. Johanna Blake and Dr. Abdul Mehdi Ali, Senior Research Scientist at the department. I studied the reactivity of ash in water produced by burning tree species at 350° and 550° C. Using Spectroscopic, Microscopic and X-ray diffraction analysis, release of heavy metals (Cu, Cr, Fe, Mn) in the water from ash produced at 350° and 550° C was confirmed. This study is an important contribution to understand the nature of the Wildfire threat to water supply and act accordingly. The NM EPSCoR externship program has enabled to me to do collaborative research and enhanced my technical skills. Most importantly, I have learned to think independently as a researcher which is a valuable skill to build upon for my Master’s Thesis and future research.